Together they strike one of the most identifiable images of all basses. The patented Steinberger fixed bass bridge uses the Double-ball tuning system to ensure stability. Add a Steinberger Spirit XT-25 5-string electric bass to your collection when you're ready to step into the future. PLEASE! DO NOT BID IF YOU ARE NOT A SERIOUS BUYER!!! Bolin NS (Steinberger) Bass - Fretless 5 String. Condition is Used. ONE STEINBERGER SPIRIT XZ-25 HEADLESS, FRETLESS ELECTRIC BASS GUITAR! It is in (my opinion) excellent condition! It has been used (played), and all electronics work great! THIS IS HOW THE MONEY YOU SPEND ON THE GUITAR IS PROTECTED. 3 band pickup selector switch, passive pickups, gig bag included, made in 1987 limited production run, in near mint condition. Killer Steinberger L2 4 string. Neck is perfect with great action. Was it replaced with a Lefty neck?. You can also see from the pics that the neck plate is slightly off kilter from the body. The thumbscrew for the drop tuner was missing. So here's what I know The action need to be adjusted, but it plays fine now (I like low action). Hello 80's. Hohner professional headless bass. See pics for cond. Steinberger L2 bass guitar - serial no. 587 - 1982!! Here is an early Steinberger L2 bass guitar, serial numbered 587, which dates it to late 1982. I have owned this bass since 1989 when I acquired it from its original owner. I used it extensively for years as a "travel bass", as it is much easier to carry in and out of crowded subway cars than a conventional bass. Very nice bass guitar with normal small blemishes on it from normal use. Plays great. Includes soft case. qx-2db 4 string with a db bridge. For sale is a 1987 Steinberger GL2T TransTrem Headless Guitar serial number 4399 with a non-original bag. This guitar has been played, is in very good condition, and in perfect working order. Overall, I would rate the condition a solid 8.5 out of 10. Steinberger 5 String Electric Bass Guitar. Condition is New. Here's a 1990's Steinberger doubleneck guitar in a factory original black finish. Page down to see 50 HD Images of this guitar. We can declare a low value. The frets are in good condition. All the electronics were bench tested and work fine. 1984 Steinberger XL-2 Bass a great player, really clean & very user friendly ! When these appeared in the early 1980’s, they were rapidly adopted by new pop bands and are heard on many recordings of the period. She plays great & is a very complete bass having no mods or changes. ・Bridge,headless,body shape,doubling as tuning machine is still fresh style. MPN: Spirit XT-25 Bass White. Neck Joint: Thru-Neck. ・Lightweight, compact size and convenient to carry. Scale: Length 34”. EMS is safe, fast (approx. Ishibashi Music Corporation. Accessories: Hardcase (key missing, and the handle has been repaired). Country: USA. ). State: S: new Accessories: Soft case. Our Products are 100% Authentic. 80's 1985 Arbor Headless Bass, with Gigbag. ULTRA RARE. This bass has one thick killer sound. Its a killer rock tone might thor of bass! Well made and perfect neck through design. Its perfect for recording and studio work. Steinberger XL-2 bass in excellent total condition with the original Steinberger gigbag. Bridge: Patented Steinberger Bass Bridge With Direct-Pull 40:1 Fine Tuners. Machine Heads (Tuners): Patented, Steinberger Double-Ball System. Nut Width: 1.5" At Zero Fret (4.1cm). Scale Length: 34". No problem with the output and electrical system. It was highest model in Fernandes catalog in 1992. The guitar color is purple (STP). All original and exellent condition! The guitar looks and sounds great but with little small scratches and dents.With Gigbag. No problem with the output and electrical system. We can not use EMS. This is a very rare and sweet 5-string Bass. The guitar is in excellent condition with very little use since the neck was installed. Entry model Sprit series faithfully inherited the character of Steinberger boasting strong popularity. Neck Pickup: Steinberger Bass HB-2. Bridge Pickup: Steinberger Bass HB-1. XT - 25 is "5 string base" specification. 1985 Aria Pro 2 Interceptor Headless Bass Japan Ultra Rare model All original and exellent condition! The guitar looks and sounds great but with little small scratches and dents. Neck Pickup: Steinberger Bass HB-2. Bridge Pickup: Steinberger Bass HB-1. Spirit XT-2 STANDARD Bass (HYHOT ROD YELLOW). Zero Nut Width: 1.50". Bridge: Patented DoubleBall Bass Bridge. Output Jack: Premium 1/4" Barrel-Style. *NEW* STEINBERGER Spirit XT-2 STANDARD Headless Bass Frost Blue W/GB Free Ship! STEINBERGER Spirit XT-2 STANDARD Headless Bass Frost Blue. Neck Pickup: Steinberger Bass HB-2. Bridge Pickup: Steinberger Bass HB-1. 12th Fret Width: 2.156". Color: Frost Blue. Bridge: Patented DoubleBall Bass Bridge. 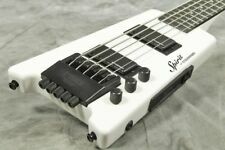 Steinberger by Spirit XT-2DB. Ready to play when you get. Truss rod works fine. Color : Black. Neck Pickup: Steinberger Bass HB-2. Bridge Pickup: Steinberger Bass HB-1. Bridge: Patented DoubleBall Bass Bridge. Zero Nut Width: 1.50'. Output Jack: Premium 1/4' Barrel-Style. Scale Length: 34'. any kind of Roseweood/Bubinga. Neck Pickup: Steinberger Bass HB-2. Bridge pickup: Steinberger Bass HB-1. 12th Fret Width: 2.40 ". Top Material: AAA Quilt Maple Veneer. Bridge: Patented DoubleBall Bass Bridge. Zero Nut Width: 1.625 ". Steinberger by Spirit XT-2DB. Ready to play when you get. Color : Black. Serial Number . Steinberger / XL-2 92 'From Japan. A synonym for headless guitar founded in 1980, Steinberger! Ned Steinberger brings knowledge and experience as an industrial designer to the guitar. Steinberger genuine soft case is attached. Neck Scale: Long. Finger plate material: Rosewood. We are "East Island Crew" from Japan. Several minor scratch/dent can be seen. This is a comprehensive study on how to play the Bass Guitar ! With one of the world’s greatest Instructors ! Influenced Bass players. All over the world ! This Video Series takes you on step by step instructional trip that shows you how to play the Bass Guitar ! Neck Pickup: Steinberger Bass HB-2. Bridge Pickup: Steinberger Bass HB-1. Spirit XT-2 STANDARD Bass (HR/HOT ROD RED). Zero Nut Width: 1.50". Bridge: Patented DoubleBall Bass Bridge. Output Jack: Premium 1/4" Barrel-Style. The bass forms the backbone of many modern bands, spanning several genres from jazz to rock and everything in between. Many aspiring musicians will recognize the name Steinberger. Steinberger basses stand out from typical bass guitars and look radically different. There are numerous models of guitars and basses available on eBay from a variety of sellers, as well as many accessories, like pedals, bass amps, and cases. What Makes a Steinberger Bass Different? To say that Steinberger basses, designed by the acclaimed musician Ned Steinberger, are unique is an incredible understatement. These models are vastly different from what most people consider to be a typical bass guitar. All of the models from Steinberger are headless and have a minimalist look. Many famous musicians use these bass guitars on stage, including Lou Reed, Mr. Hardgroove, and Ken Sinnaeve. There are both four-string and five-string models available (the 5th string being a B), and basses range from entry-level to professional. Which Features Do These Basses Have? There are many features that Steinberger basses have that make them popular choices. Because of their headless design, these basses are quite lightweight and are also easily portable. Many know these basses for their bold designs and smooth tonal response, as well as their solid intonation at any position on the neck of the instrument. Steinberger makes these bases with quality in mind, constructing them out of many quality woods. For example, the XT-2 Standard electric bass has a three-piece hard maple neck and a poplar body. There are a few different models to choose from depending on what you want. The XT-2 Standard bass is a four-string bass that has a patented doubleball bass bridge, 40:1 ratio direct-pull tuning, and quality humbucker pickups for optimal sound. It is available in many colors including black, frost blue, and yin yang gloss. There is also a left-hand version available. The XT-25 Standard Outfit bass is a deluxe five-string bass that uses full-tone bridge and neck pickups, as well as controls for both pickups. This bass consists of hard maple and poplar, and has a gloss finish. It is a part of the Steinberger Spirit Collection and is available in both white and black. The XT-2DB is an interesting option in that it has a DB tuner system that allows for instant drop tuning of the low E-string to D. Steinberger designs this bass with tone in mind, even while using the drop tuning. This bass has 24 frets, a neck shape inspired by the 1960s, and a gloss finish. It is also a part of the Spirit Collection and is available in black. Content provided for informational purposes only. eBay is not affiliated with or endorsed by Steinberger.